There has been a Significant Name Change to a hill that appears in the Yr Uchafion and 500m Twmpau lists, with the height, drop and status of the hill being confirmed by a survey with the Trimble GeoXH 6000 which took place on the 18th July 2016. 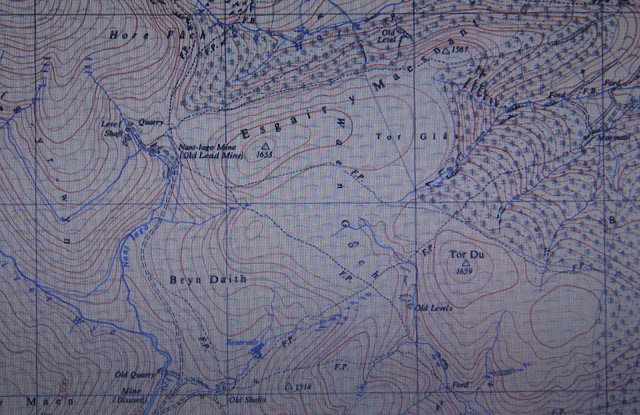 Yr Uchafion - All Welsh hills at and above 500m in height that have 15m minimum drop. The list is co-authored by Myrddyn Phillips and Aled Williams. 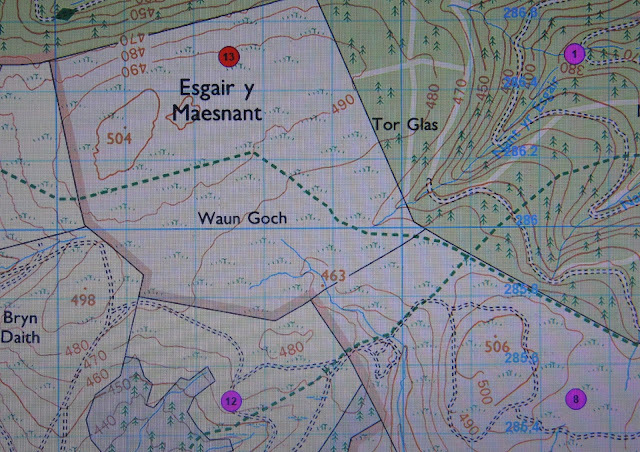 500m Twmpau - All Welsh hills at and above 500m and below 600m in height with 30m minimum drop, with the word Twmpau being an acronym standing for thirty welsh metre prominences and upward. The list is authored by Myrddyn Phillips. The hill is a part of the Pumlumon range, which is an extensive group hills in the north-western part of Mid and West Wales, and it is situated above the A 44 road which is to its south and is positioned between the small communities of Llangurig to its south-east and the even smaller community of Eisteddfa Gurig to its west south-west. The hill first made an appearance in an unpublished hill list in 1985 when Tony Blackburn listed it as Tor Du in The 500 Metre Tops of England and Wales, and was later included by Michael Dewey and listed as Esgair y Maesnant SE Top in the April 2002 edition of Strider which included the updates to The 500-Metre Tops of England and Wales list that appeared in his Mountain tables book published by Constable in 1995. 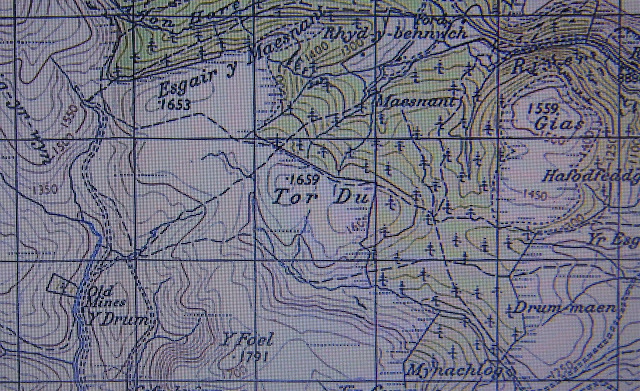 These two listings relied upon Ordnance Survey maps of the day for the hill names used within their compilations, and as shown below by extracts taken from a number of Ordnance Survey maps there are hill names that for inexplicable reasons do not appear on subsequent published maps, and this is what has happened in relation to this hill and its name. When this hill was first included in the Yr Uchafion and the list that later became known as the 500m Twmpau it was listed as Esgair y Maesnant South-East Top, with the use of a directional name based on its adjacent peak toward the north-west, and this is the name used when the details relating to a rudimentary survey that gave the hill over 30m of drop were sent to Michael Dewey, who excepted the survey result and listed it as Esgair y Measnant SE Top. 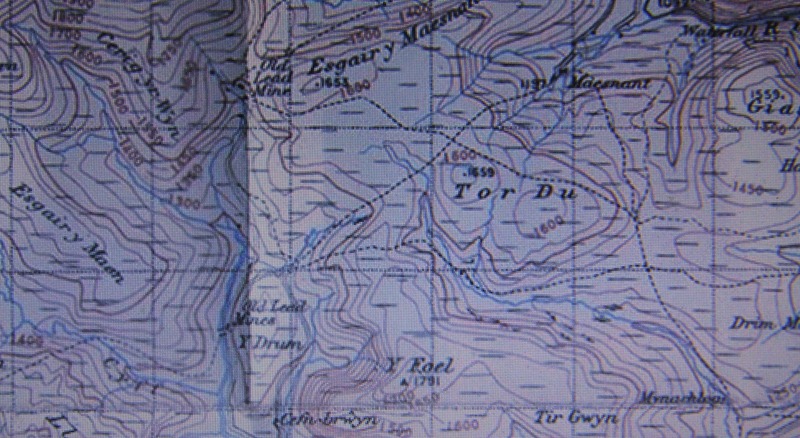 The information sent to Michael was reliant upon Ordnance Survey maps of the day and these did not show a name for the hill. Over recent years there have been a number of Ordnance Survey maps made available online, some of these are historical such as the series of Six-Inch maps on the National Library of Scotland website, whilst others are current and digitally updated such as the enlarged map hosted on the Geograph website. Three of the historical maps now available are the Ordnance Survey One-Inch Seventh Series, One-Inch New Popular and the historical 1:25,000 map, all of which relied heavily for their place-name detail on the series of Six-Inch maps. 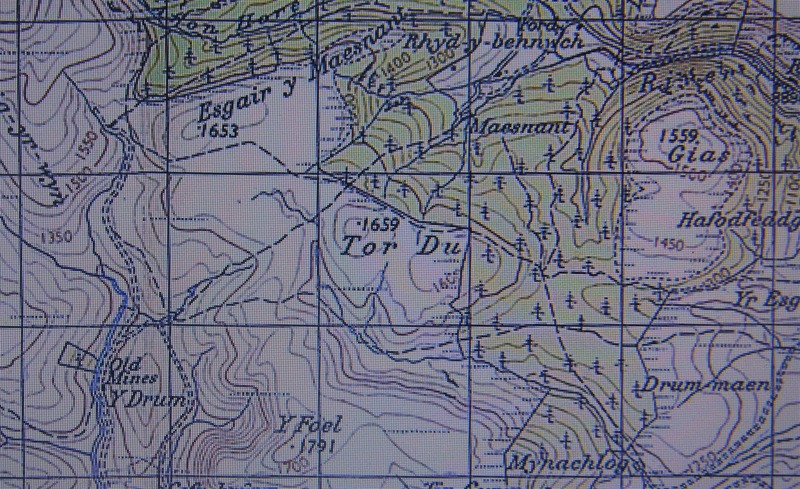 Extracts from a number of Ordnance Survey maps appear below giving detail relating to the name Tor Du and its placement at or near the summit of this hill, and its exclusion from current Ordnance Survey maps. It was because of these earlier Ordnance Survey maps that this hill was subsequently listed in both Yr Uchafion and the 500m Twmpau compilations as Tor Du. However, place-name data can be substantiated by making local enquiries, and on the day when this hill was Trimbled I asked a number of farmers who were relaxing in the early morning sunshine vapouring, the names of the hills. I was subsequently offered a lift up to the bwlch between Y Drum and Esgair y Maesnant by Huw Meyrick, who had lived in the area for twenty years and was only too happy to talk about the hills and their names, and along with giving many other hill names Huw named this hill Tor Du, substantiating the hill’s name that unfortunately no longer appears on contemporary Ordnance Survey maps. 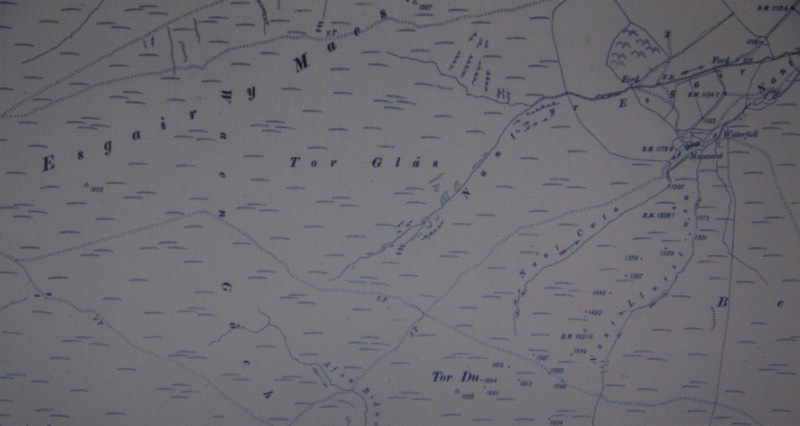 Therefore, as a result of detail on old Ordnance Survey maps which has been substantiated by local enquiry the hill has subsequently been listed under the name of Tor Du in the Yr Uchafion and the 500m Twmpau.